If anybody’s dreaming about a government JOB, then passing out the DOEACC / NIELIT CCC Examination is mandatory with the new government recruitment rules. The CCC / CCC+ Certificate is actually the assurance about the individual, if he / she is well equipped with the standard level IT skills. You can anytime check the complete / detailed CCC / CCC+ Online Exam Information by following one of our previous how-to post about the CCC Online Examination / Certificate / Registration. Today we are here with one of the most important success factor for the CCC / CCC+ candidates, the CCC Online Test / Demo Practice Exam Series. Believe or not, this will add a new dimension to your’s CCC Exam preparation process and will surely boost the chances to crack the CCC Online Exam at your first attempt. At the time of CCC Online Exam Introduction in 2012, there was very limited CCC Study Material & CCC Exam Preparation Books available online / offline. With the passage of time, the DOEACC / NIELIT CCC Online Certification had collected enough recognition to inspire online / offline publishers to release sufficient Quality Study Material for CCC Exam. Although, there is enough CCC Study Material from the last 2-3 years, the CCC candidates always feel nervous prior to their official CCC Online Examination. To settle down the butterflies in their stomach, to provide real feel of the Official CCC Online Exam, here comes Free CCC Online Test / Demo CCC Practice Exam Series. In the first phase, 15 Practice SETS of CCC Online Test 2018 / Demo Exam will be provided in English language. In second phase, 15 Practice SETS of CCC Demo Test 2018 / Online Exam will be provided in Hindi language. Once, both the phases are completed, we will plan to provide CCC Online Test / Demo Practice Exam SETS in other languages too. DOEACC / NIELIT CCC Certificate Online Examination Schedule / Date for August 2018. In Uttar Pradesh (UP) & Uttarakhand (UK) – from 1st August 2018. In other States (other than UP & UK) – from 4th August 2018. Note: Admit Card for CCC August 2018 Exam is / will be available to download / print from 27th July 2018. DOEACC / NIELIT CCC Online Test 2018 / Demo Practice Exam SETS Sections / Result / Achieved Grade / Marks Weight-age / Qualify-Passing Score / Correct Answers. The CCC Online Test / Demo Practice Exam SETS have been divided into 2 section. While attempting the CCC Demo Online Test / Exam SETS, you don’t need worry about section 1 and 2, once you complete the section 1 of CCC demo test, the questions of section 2 will arrive automatically on the CCC demo practice exam screen. Every correct question will carry 1 mark to the tally, there is no negative marking scheme for the CCC online demo exam. The first section (ques no. 1 to 50) of CCC Online Demo Test consist MCQ’s / Objective Type Questions. The second section (ques no. 51 to 100) of CCC Online Demo Test is made up of Objective True and False questions. CCC Online Test / Demo Exam Result and Grade. Grade A – Excellent (Passed / Qualified). Grade B – Good (Passed / Qualified). Grade C – Average Marks (Passed / Qualified). Grade D – Poor (Failed / Disqualified). CCC Online Test / Demo Exam Result and Correct Answers. Once you complete / final submit the CCC online demo exam, you will be taken to the instant result page with the achieved grade and correct answers along side. Free PDF Download Link for all the Questions with Answers Asked in CCC Online Test 2018 / Demo Practice Exam SETS. While compiling the CCC questions with answers into the CCC Online Test / Demo Exam SETS, special attention have been given, about only including the most important CCC questions asked in the previous year CCC examinations. For any reason, if you need to download the questions asked in these CCC online test / demo exam sets, you can anytime check CCC Question Answers or CCC Study Material section of our blog. CCC Online Test / Demo Exam Practice Sets with Instant Result. 100% Free – No Registration Required. 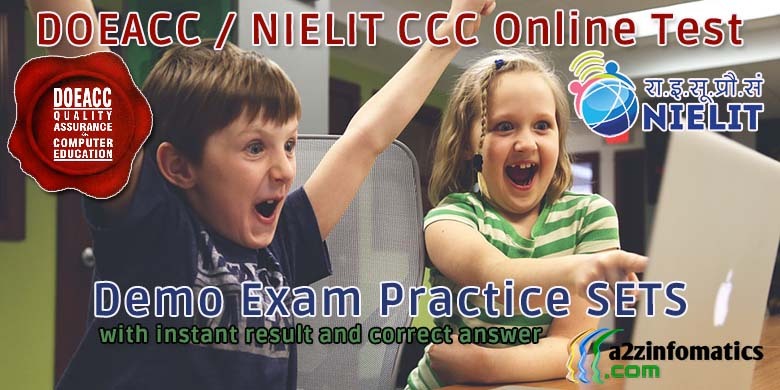 DOEACC / NIELIT CCC Online Test / Demo Practice Exam SET A.
DOEACC / NIELIT CCC Online Test / Demo Practice Exam SET B.
DOEACC / NIELIT CCC Online Test / Demo Practice Exam SET C.
DOEACC / NIELIT CCC Online Test / Demo Practice Exam SET D.
DOEACC / NIELIT CCC Online Test / Demo Practice Exam SET E.
DOEACC / NIELIT CCC Online Test / Demo Practice Exam SET F.
DOEACC / NIELIT CCC Online Test / Demo Practice Exam SET G.
Download other Helpful Exam Preparation / Study Material for CCC / CCC+ Examination in PDF Format. That’s all for now, we hope you had found the CCC Online Test / Demo Exam SETS more than helpful while preparing for the CCC Online Examination. As promised in the beginning of this post, CCC Online Exam / Demo Exam SETS in Hindi & other languages will be available very shortly. You can bookmark this page for any future reference, and don’t hesitate to share the CCC demo practice exam sets among your friends and relatives, who are preparing for the CCC / CCC+ or any other competitive exam.